The landmark program for awaking the inner adult in every teen. Half of the teens in the U.S. are diagnosible with one or more emotional, behavioral, or substance abuse disorders (2010 National Comorbidity Survey); 3 out of 4 high school seniors are incompetent in math; and 1 in 4 teen females has a sexually transmitted disease. 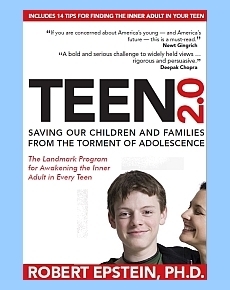 TEEN 2.0: Saving Our Children and Families from the Torment of Adolescence, a breakthrough book by one of America’s most distinguished research psychologists, will help to end teen turmoil in the U.S. Think you know everything about America’s teens? Think again…. 1. Although everyone knows that teens have too much “freedom,” teens in America are actually subjected to ten times as many restrictions as mainstream adults and to twice as many restrictions as incarcerated felons and active-duty U.S. Marines. 2. Although headlines tell us that teen turmoil is caused by an immature “teen brain,” the teen brain is a myth perpetuated by drug companies to make us put our teens on prescription drugs. And it's working: We're now giving more psychoactive drugs to our teens than all other prescription medications combined, including acne medication and antibiotics. 3. Although everyone knows that teens are naturally depressed and moody, teen turmoil is completely absent in more than a hundred cultures around the world. Most cultures don’t even have a word for adolescence. If the turmoil we see in our teens is really natural and inevitable, wouldn’t we see such turmoil everywhere? 4. Although everyone knows that teens have it too easy, the rate at which teens are being restricted is increasing every year in the U.S. Teens are now being punished or even arrested for having food fights in school, hugging, wearing sagging pants, carrying ibuprofen, wearing fragrances, bringing calculators to school, talking during school lunches, and cheering at sporting events. 5. Although everyone knows that parenting a teen can be tough, the rate at which parents are being punished for their teens’ offenses is increasing dramatically. Parents can now be fined $150,000 if their teens download copyrighted music and imprisoned for allowing their teens to drink alcohol. 6. Although everyone knows that teens can’t form lasting relationships, male teens actually have a lower divorce rate than males in their 20s. Some of the most successful relationships in U.S. history—Eliza and Andrew Johnson, Barbara and George Bush, Jimmy and Rosalyn Carter—were teen romances. 7. Although everyone knows that teens are unreliable workers, teens have the lowest rate of absenteeism from work of any age group. In fact, the older the worker, the higher the rate of absenteeism. 8. Although everyone knows that teens are reckless drivers, teens cause fatal, alcohol-related car accidents at half the rate of their elders, ages 21 to 25. 10. Although everyone knows that teens are inherently incompetent, new research suggests that seven million teens under age 18 are more competent than half the adult population across a wide range of abilities. Dr. Epstein shows that cultures that maintain continuity between young people and adults have no teen problems: no depression, suicide, drug use, or conflict with parents. Teen problems in our culture are caused by two factors: 1) Teens are almost completely isolated from adults, trapped in the vacuous, media-controlled world of “teen culture,” learning almost everything they know from peers, “the last people on earth from whom they should be learning,” according to Epstein. 2) Teens are “infantilized”—that is, treated like young children—well after puberty and no matter how mature, capable, or smart they are. We have artificially extended childhood well into the teens, and lately into the twenties, with disastrous effect. The solution, says Epstein, is “to provide incentives and opportunities for teens to enter the adult world just as soon as they can demonstrate readiness in one or more areas.” Families can make this happen on a small scale; society at large can do this through competency testing, just as it does with drivers licenses today. A Ph.D. of Harvard University, Dr. Robert Epstein is Senior Research Psychologist at the American Institute for Behavioral Research and Technology and the former editor-in-chief of Psychology Today. He is the author of 15 books and more than 300 articles on adolescence and other topics in psychology.